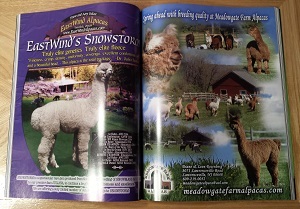 We have available for sale, the Summer 2007 back issue edition of the Alpacas Magazine. 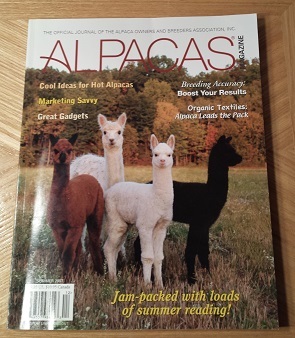 This Summer 2007 issue of the Alpacas Magazine has been previously read, but is in good and complete condition. 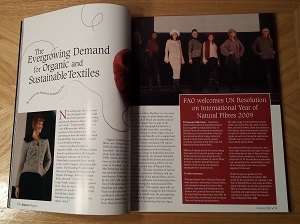 If you are interested in purchasing this magazine, please be sure to contact us. 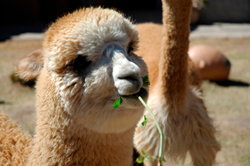 National Alpaca Farm Day in the U.S.A.
AOBA spearheads drive to create new American tradition: touring the Alpaca farms and ranches the third weekend of September. Sign up to participate! 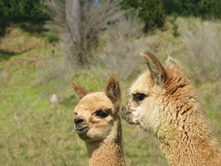 Evaluation of insulin secretion and sensitivity in Llamas and Alpacas. 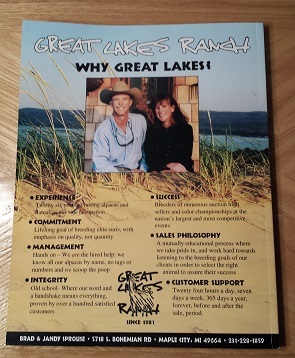 Other on-going MAF sponsored studies are highlighted as well. "Green" is "in," as proclaimed by the United Nations International Year of Natural Fibres. 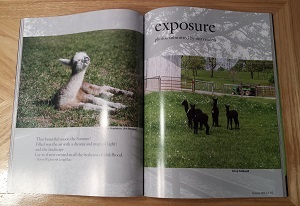 Alpacas present a shining example of a sustainable, environmentally friendly business. With the lion's share of Alpaca manufacturing materials, Peru is the leader in Alpaca product exports. But which countries are buying? And at which stage of production? Old timer Alpaca owners may forget just how foreign it feels to be a brand new owner. Taking those feelings into consideration is more than just a matter of empathy. A little PVC pipe, some mesh wire closet shelves, and a bag of plastic zip-lock ties - presto! Build yourself a top-notch fleece skirting table for less than a hundred bucks. Your banner is the singlemost important component of your off-ranch booth display. Follow these tips to maximize its impact. New alpaca owners need a good mentor to help them get started, but picking the right colleague can be daunting task. Here are some suggestions on ways to narrow the field. In order to do a good job of achieving genetic gain from one Alpaca generation to the next, breeders need to carefully analyze all the options. Good information - good decisions. Alpaca breeder journeys to remote Peru to visit the family of the late nonpareil Alpaca breeder, Don Julio Barreda, and finds both turmoil and tenacity. Forward thinking members of the Alpaca community gathered to brainstorm ways of developing an even greater marketing presence for Alpaca goods. Reflections on summer, complemented by reader submitted photos. Milligrams per millimeter... 10% concentration.. vitamin units... it's enough to make your head swim. Relax - Dr. Steve explains everything you need to know. VEGAS! 2008 F2F Rocks the Strip! Here's a quiz. How can you combine alpaca training seminars with a tax deductible business trip to the world renowned Las Vegas strip? Answer: come to the 2008 Fiber to Fashion conference! On your next weaving project, use thin, thick and ribbony yarns to achieve interesting effects. Multi-color yarns to achieve interesting effects. Multi-color yarn in the warp also creates unusual hues and patterns. Three creative ways to save time, money, and effort. Perform surgery on your plastics; handle teeth trimming more easily; and fashion a creep feeder, lickety-split. Every year, camelids die from heat stress. Tragically, this condition is almost always preventable. Read this article and be prepared to act on it, to avoid great heartache. Introducing the "Coolatron 5000," complete with Towelamatics, Drizzlators, and Modulating Mistalators with Deepifying Soakification! 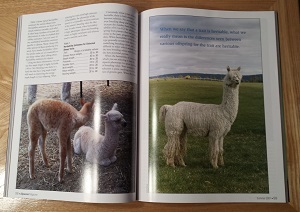 Curious about how things are going in the alpaca industry? 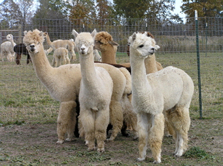 Alpaca owners express their experiences and opinions, and for the most part, the assessment is extraordinarily upbeat! Alpaca colors and patterns are the result of bio-chemical processes programmed by the genes. This researcher is improving our knowledge of this fascinating topic. Just how far will some alpaca owners go to showcase their assets whilst raising money for a worthy cause? This chocking expose reveals the naked truth. Topping over 100,000 registered alpaca owners for the first time, here is a year-by-year breakout from the inception of the Registry.